Georgette Heyer is my go-to when I need some fluff in my life. Luckily, the woman was a prolific writer - writing over 50 novels in her lifetime. Friday's Child was a fun read. It centers around Sherry, a dissolute young man in need of a wife in order to inherit his fortune, and Hero, a naive impoverished girl. The two have been friends since childhood. Like many of her books, the story doesn't take too many predictable turns. The couple marry straight away on a wild whim. The book follows their difficulties in learning to be married. The best thing in this book is their circle of friends. They are made up of interesting young men who constantly point out what an idiot their friend Sherry is. 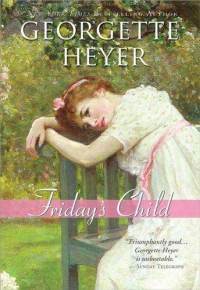 I love Heyer's romances. They don't stray at all into bodice ripper territory (not that there's anything wrong with those of course). They stay the path of the comedy of manners - a genre I simply adore. 5/10 stars.